I am in the Lake District having a jolly old time - more of which next week - and so far I have been blown away by a) the number of hugely talented local designers and makers there are; b) the number of camping shops there are; and c) the number of lakes there are. Let's focus on the first for now, and more specifically Amanda Mercer, a Contemporary Applied Arts graduate working in Carlisle. 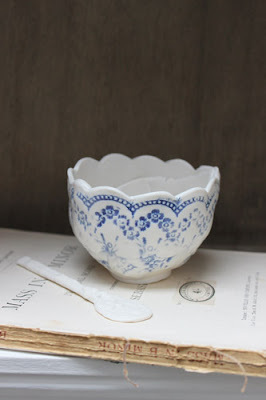 Amanda works in porcelain to create gorgeous things for you, your clothes, and your home. I discovered her work in a teeny-weeny shop yesterday, and can vouch for how lovely everything looks in real life. This wedding button is just so sweet, isn't it? It's £6. I'm a sucker for blue and white ceramics - something I inherited from Mama B, whose collection is VAST and BEAUTIFUL. I don't really discriminate between old and new - both have a place in my heart. This lace imprinted sugar bowl and spoon, like the bunting at the top of this post, is so delicate and pretty. 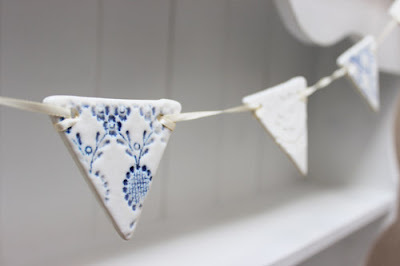 The bowl is £30 and the bunting is £40 - Amanda can make porcelain bunting to your specification if you have a particular design or colour scheme in mind. 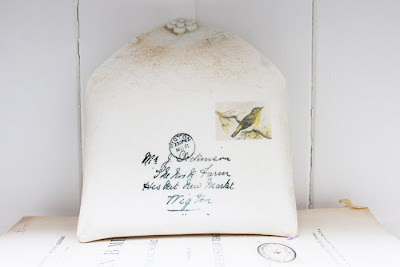 I don't know what I'd use a porcelain envelope for, but I sure as hell want one. This butterfly coaster is £15, so I'd have to make sure only my very special mugs rested on it. 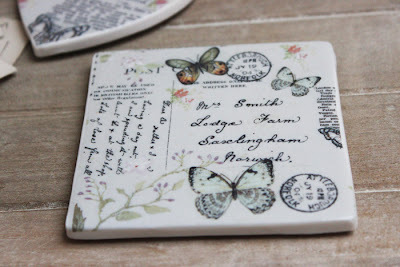 I love old postcards and reading other people's scrawl, so this would be the perfect way to while away my coffee breaks. More buttons! These have a tape measure design, and are just £8 for a set of four. All Amanda's buttons are beautiful - in the shop I was in, I spotted some decorated with prints of old stamps, but I can't find them on her website yet. I so wish I'd bought them. CURSES. Love! Love! Love! This is a great idea indeed! Love the designs and creativeness. A must try at home.